Surprisingly, a number of the parts for this amazing piece were bought off the shelf. The irises that open and close they eyes, for instance, were bought on eBay. This is not to downplay the amount of custom design, though. The mechanism that moves the feathers is a sight to see, and there’s a lot of hand-machined metal holding it all together. But the payoff is watching the thing move under remote control. The eye dimming and closing, combined with the head movements, make it look almost alive. The 90s were a remarkable time for Sci-Fi movies, in that there actually were sci-fi movies, and not sequels to a reboot of yet another comic book movie. One of the breakout hits from this era was Stargate, the film and three syndicated television series. With a corpus this large, a few Stargate builds made it into our Sci Fi contest, and from the looks of things, they’re pretty cool. The Ma’Tok staff is an energy weapon used by Jaffa warriors that fires a concentrated plasma bust over 70 yards. While we question the utility of a weapon that’s only accurate to 70 yards on the battlefield (like, arrows are better, man) [frankstripod] is making his own version. Instead of plasma bolts, it’ll be a hairspray-powered PVC potato cannon. The Ancients in Stargate Atlantis had a multifunction handheld device capable of detecting life signs, observing multiple frequencies of the electromagnetic spectrum, and finding power sources. Basically, it’s a smartphone that’s not from Star Trek. This scanner became an important piece of commandeered technology, and these guys are building their own. Qi wireless charging, touch screen, IR transceiver, and everything a real tricorder should be. Wait. Where did he get Naquadah? What good would a post on Stargate builds be without an actual Stargate? [shlonkin] and [dkopta] are doing just that, complete with a rotating right and light-up chevrons. Here’s a video. Video below, of course. The Sci-Fi contest runs until the end of the month, so there’s still time for you to get in on the action and get your hands on some really great prizes. We’re giving away O’scopes, soldering stations, dev boards, some sweet Sci-Fi prizes, and awesome Hackaday T-shirts. The Hackaday Sci-Fi contest has 36 entries so far. Since there are fifteen prizes available, you stand an excellent chance of winning; but you can’t win if you don’t play. It’s pretty easy to be considered for the contest. You simply need to hack together something Sci-Fi related and show off your work. Head over to the contest page and check out the details. Ten of the prizes are popularity-based, so posting early is the best bet! For those that were put-off by the team requirement, there’s a hack to get around that. Since this is a themed contest we thought we’d give you an update on where inspiration is coming from. Below is the break-down of each Sci-Fi universe that has been so-far adopted by the entrants. We’d like to point out that this isn’t limited to movies, as the bulk of inspiration is to be found in literature. Why don’t we get a comment thread going here to help brain-storm for people who want help locking onto an idea? Oh, and if you’re wondering about the banner images. These were taken from three of the contest projects. The upper left is a GLaDOS replica controlled by Google Glass (complete with Nerf dart gun) inspired by Portal. Bottom left is a pair of Peril-Sensitive sunglasses inspired by A Hitchhiker’s Guide to the Galaxy. And the bottom right is a life-sign scanner inpired by Stargate Atlantis. 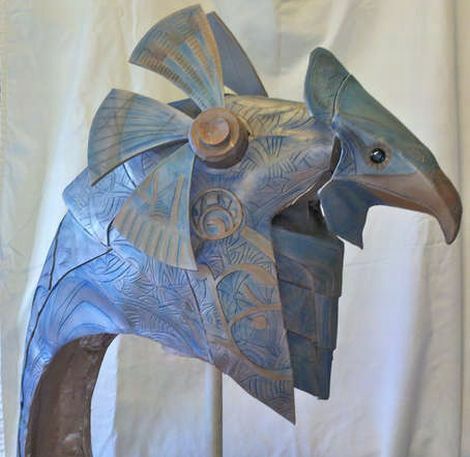 [Jerome Kelty] is a big fan of the movie Stargate, and when he saw it for the first time, he wanted one of the awesome helmets worn by the Horus Guards. This isn’t the kind of thing you would normally find at your local costume shop, so he knew that he would have to build one of his own. After rejecting multiple designs over the years, he finally came up with a solution that he thought would work well. His Horus Guard helmet was constructed primarily out of cardstock, papier-mâché, spray foam, and spackle. Don’t let that list of materials give you the wrong idea about this helmet however – it looks absolutely amazing! Not only does it look good, but it moves just like the guard’s helmets in the movie too. To control the helmet’s movements [Jerome] used an Arduino animatronics setup he designed, which we’ve seen before in his slick Predator build from last year. The Arduino controls a set of 5 servos, which are tasked with turning the helmet’s head and actuating the fans mounted on either side. Stick around to see a short video of the mask in action, and if you’re thinking of building one yourself, be sure to check out his writeup for a very thorough BoM. 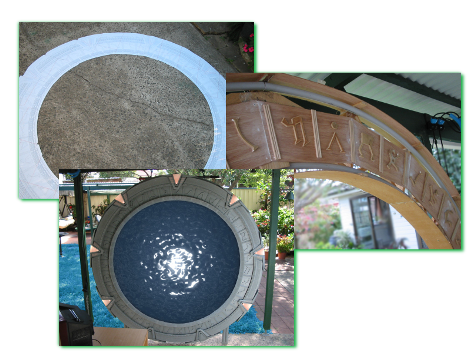 PVC, wood, and some creativity bring this Stargate duplicate to life. [Mango] and his father started with AutoCad drawings taped together, and ended with the Stargate you see before you. Sure it’s not 22 foot in diameter and not made of Naquadah, but its inner ring rotates and dials like the real thing and it has all 39 symbols – hand carved. Catch a fun and entertaining video with the Stargate after the break.